As I was rocking Emmy before bedtime, I heard the unmistakable whoosh of cars driving in the rain. And as I sat down at my computer, the gurgle of rain tumbling down the gutters filled my ears. We begged spring to come; and with spring comes the rain. Last Saturday was very warm and all our snow started to melt. Ed decided to take the girls outside to splash in the puddles while I finished getting ready for the company we were having. Emmy loves water: “wah-ee”, and Lily loves her rain boots! (I love stating the obvious, much to Ed’s chagrin, as you’ll see in my video clip. There’s also a glare from the snow; the only thing I remember from my college meteorology class is the term “albedo.“) Even though it wasn’t raining, I caught the girls playing in the water just as the little girl in the book Rain Talk plays in the warm summer rain. Splashing in Puddles from Ginny Marie on Vimeo. 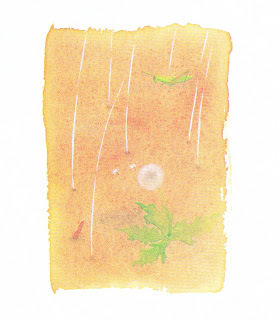 Rain Talk is a beautiful book, in both words and pictures. When I was a first year teacher, I was surprised at how few picture books were in my first classroom. Throughout the years, I bought many books to add to my collection. A few of those books were read by my students, but remained unread by me. My book collection came home with me as I paused my teaching career to raise my daughters. I recently read Rain Talk to my youngest. As I was reading, I was delighted at the simple story about a girl out in the rain, listening to all the sounds rain has. The sound of rain beginning is quite different from the sound of rain hitting a pond, or the “Bup Bup” of rain on an umbrella. The watercolors by Keiko Narahashi enchanted me. They fit the words perfectly. See the drops of rain hitting the dirt, and the small worm poking his head out? Each little drop digs a dark little hole and the smell of wet dust tickles my nose. 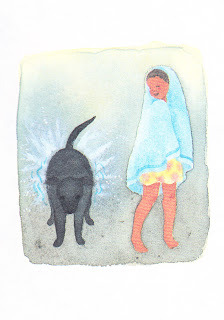 I love this illustration of the dog shaking his coat: What a cute book to read on a rainy day, or any day!